The Badge and the Title of each tile are the two constant indicators that are shown on the tile, even when the Peek Template is shown. They can be used to convey information to the user in a visual manner (e.g. through images) or through text (the title) and a number (the badge). The title is in the bottom left corner of the tile and the badge is in the bottom right corner. They have a 10px offset from the border of the tile. Text - this is the string that is displayed in the title. ImageUrl - the URL to an image that will be used as title for the badge. It takes precedence over the text. When text is used it is rendered inside an <h6> element that takes 70% of the tile's width when in text mode. The 10px offsets are kept for both text and image title. There are no minimum or maximum dimensions for the image title so the developer can design the tile freely. 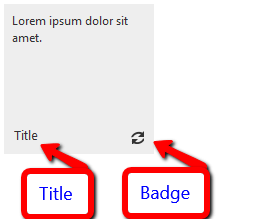 The <Badge> inner tag inside each tile controls the behavior of the badge.It exposes the following ways to set the content, listed in order of precedence (the last one hasthe highest priority).